"Never use a Ouija board alone!" This is a statement spoken with the foreboding of impending disaster in horror movies and it is usually followed by a series of dreadful events involving demonic possession, head spinning and bizarre deaths. Unfortunately, many people's only knowledge of Ouija boards comes from what they see in movies and on television. And so, despite the absence of any basis in reality, it has become a popular belief that Ouija boards are dangerous, especially, if they're used alone. The fact is, Ouija boards can be used safely by all except those who suffer from mental illness. So, rest assured. As long as the sitters involved are mentally healthy people it is very safe to use a spirit board either alone or with others. Fundamentally, Ouija boards, whether manufactured by Parker Brothers or hand made spirit boards, are simply wood, paper fibers, plastic, glass, paint and whatever other ordinary substances go into their construction. There is nothing to fear in a Ouija board. Furthermore, Ouija boards only work when people are involved. They are simply a psychic tool like any other tool. You can use it wisely or destructively. And, some people are more skilled at using these tools than others. Many people get good results with the Ouija board when they are, fearless, well-intentioned and have in their minds the entity or the kind of entity with whom they wish to communicate. 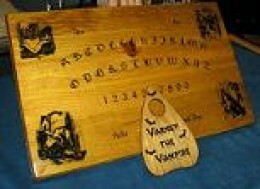 Early spirit boards were all made of wood, with letters and symbols painted onto the board. "Ouija" is the name of a particular spirit board trademarked by Parker Brothers. In the past these boards had different names under different manufacturers. The word "Ouija" is a term applied generally to all spirit boards. In 1880s, businessman Elija Bond introduced the first spirit board as a parlour game. In 1891, Charles Kennard of the Kennard Novelty Company patented the first spirit board in the U.S. under the name "Ouija." Popularly, the term "Ouija" is said to have been derived from the French and German words for, "Yes," "Oui" and "Ja." But, Kennard said he gave the board this name because the spirit board told him that "Ouija" was Egyptian for "Good Luck." As far as anyone knows, this is not Egyptian "Good Luck" or anything else. Yet, in the beginning of their manufacture, they were actually referred to as "Egyptian Luck" boards. In 1854, Adolphus Theodore Wagner patented the first "talking board" in London, England. In 1898, Ouija board manufacture was turned over to William Fuld. The boards would become alternately called "Fuld boards" for a time. In 1913, a Spiritualist named Pearl Curran began receiving message from an entity called "Patience Worth," through the spirit board. The result was several books authored by this spirit who originally lived in England during the Middle Ages. In 1966, the Fuld patent was sold to Parker Brothers. Early Parker Brothers boards were made of wood, but soon this gradually gave way to cheaper manufacture until now they are made of only cardboard and plastic. Now there is a variety of spirit board manufacturers besides Parker Brothers. For example, occult author Raymond Buckland has his own "board," which is made of laminated paperand here are more sophisticated-looking boards made of cardboard and plastic or glass, such as The Psychic Circle. And, there are numerous independent spirit board manufacturers who are still making gorgeous wooden boards. Of course, the quality of these boards varies. There are many complaints about the new Parker Brothers Ouija boards, which is why there are so many different kinds of spirit boards being manufactured. People are looking for higher quality and better functionality in their boards. Any board you consider purchasing should have a highly slippery surface. There should be little friction between the planchette and the board. There should be plenty of room for the planchette to slide around on the board without falling off. This is a big problem with some currently manufactured boards. The planchette should be an appropriate size for the board. The main problem with the current mass manufactured spirit boards. Some makers have decreased the size of the board without considering the size of the planchette. Unless you're a collector, you may not have many boards in your possession to choose from. So, choose wisely, especially if you are choosing a custom board. Select a spirit board you feel strongly attracted to. How Do Spirit Boards Work? Ouija boards work through a process called psycho-kinesis, which can occur once there is sufficient build up of bioplasmic energy in the instruments of the board and planchette. Some people have better luck getting the boards to work than others. A variety of factors come into play with regard to achieving success with spirit boards. A person working with a Ouija alone must have a very strong supply of his or her bioplasmic energy. The sitter must be strong and healthy. This is one reason why the boards sometimes work better with more than one person. Usually, multiple people supply more bioplasmic energy than a single person. Only in recent decades have spirit boards been associated with anything negative. Early experimenters used them as part of their investigations into the nature of the world beyond. Alex Kardec talks about their use in The Book of Mediums. Other experimenters wrote of their personal experiences with the boards, none of which involved the elements common to stories today involving poltergeists and demonic possession. Positive experiences with spirit boards center on the intention of the user. When the sitter is clear-minded and focused does the board become a means of spirit communication. The sitter gets out of the board what he or she puts into it. One example concerns a young woman who has used her spirit board alone to receive messages of comfort and guidance from her deceased grandmother. She communicates regularly with the spirit of her grandmother who has served as a support contact or "control" for other spirit communications, all of which is very positive. Once you have selected a Ouija or spirit board you are comfortable with you can begin your first session. Of course, you can invite a friend, but it is also entirely possible to get good results alone. Semi-darken the room so that you can relax and focus more easily. Arrange the room so you can be comfortable with the board on your lap. If you have a video camera, set it up to focus on the board. You will probably have to illuminate the board a little to get a good image. You might also want to set up your video to run off the electrical socket instead of its batteries. Even minor spirit manifestations can drain brand new batteries in a matter of a couple of seconds. Alternatively, you can use a digital recorder. The benefit of using is a recorder is that when the planchette begins to move, you can speak the letters aloud. Also, you have the chance of recording some Electronic Voice Phenomena (EVP) during the session. Keep extra batteries handy. Make sure the feet of the planchette are clean and that the Ouija board is free of dust. A soft, dry towel will sufficiently wipe away dust or fingerprints so that the planchette can glide freely. Sit with the board on your lap. Place one or both hands lightly on the planchette. It is imperative that you are comfortable and relaxed. You may begin your session with an invocation or prayer. This can be something really simple or it can be as elaborate as you'd like. Some people even begin the session with an elaborate ritual. But, it is enough to say something simple that states your purpose and asks for help. For example, "I call upon my guardian angels to aide me and oversee this operation." Ask aloud if the person you're talking about is available. Be patient. It takes time for the planchette to build up sufficient bio-magnetism, especially with a single sitter. If you don't have success after half an hour, take a break. Come back and try it again after some water and a light snack. Many external factors play into success with the Ouija board, as well. Sunspot activity, the weather and astrology are a few. This is another reason it pays to sit with the board regularly. Be consistent in your sessions. Sittings held at the same time every evening or every week tend to yield the best results. Persistence pays off. It takes time for the board and the planchette to be imbued with your energy. This is why you may have to work with it for some time before you begin to see results. If you have a clear head and you are not in a state of any kind of mental or emotional upset, you will have better clearer communications. Pay attention to external factors, as well, such as thunderstorms, geomagnetic, solar activity and astrological timing. 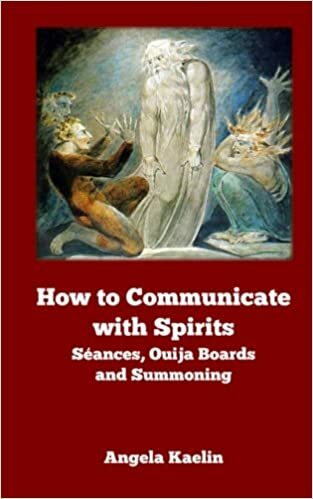 "How to Communicate with Spirits: Seances, Ouija Boards and Summoning," is partially a manual for paranormal investigation using the spirit board. It is true that the boards are just boards, but, they do have the tendency of opening up people's psychic and mediumistic abilities. Therefore, using the spirit board in the way it should be used is actually a very good tool for psychic development and paranormal investigation. Spirit boards are, also, excellent tools for meditation. Using a spirit board as a meditative tool can lead to spirit communication. The most important thing is what is in the mind of the sitter. The spirit board can be a tool for uplifting the soul and attuning to other frequencies or planes of existence. It is not pleasant to see the use of spirit boards maligned or hearing of them being misused or abused by silly or irresponsible people. The book, How to Communicate with Spirits, sets the record straight about how they may be used beneficially. How to Communicate with Spirits: Seances, Ouija Boards and Summoning explores practical methods of communicating with spirits. Includes tips and insights into different types of spirits and seances, Ouija sessions and summoning rituals. Includes "How to Use the Ouija or Spirit Board to Talk to the Dead," The Ouija or spirit board is a tool used by spiritualists since the 19th century, which is well known to increase your psychic and mediumistic abilities. Because of Hollywood movies, the Ouija has become a controversial topic for people who take their education on the matter from popular culture, although, using a spirit board is not much different from using a tarot deck. Historically, the spirit board is the tool for the development of psychic mediumship and communication with the dead. This is a no-fluff, non-moralizing approach to contacting all kinds of entities, including dark spirits. Get it at Smashwords, Amazon, Barnes & Noble and other booksellers. Disclaimer: The information at this web site is provided for informational purposes only and should not be regarded as medical, legal, financial or any other professional advice.